Health Systems looking to lease space in office buildings for Ambulatory Surgical Centers (ASC) cannot assume all buildings will comply with the zoning and healthcare codes and use requirements. A visual assessment by an experienced healthcare architect and engineer, to ensure a building’s compliance, is needed prior to concluding negotiations for the space. Each state’s Department of Health regulates the development of ASCs and requires the implementation of Life Safety codes, with which commercial architects may not be familiar. An architect and engineer experienced in ASCs will evaluate the site, as well as specific floors or areas, to determine whether it has the appropriate zoning for use as an Ambulatory Surgery Center. Healthcare designers, both architects and engineers, need to understand the NFPA 101 codes and FGI Guidelines specific to the state in which they are working, in addition to state and municipal codes governing health and zoning issues. 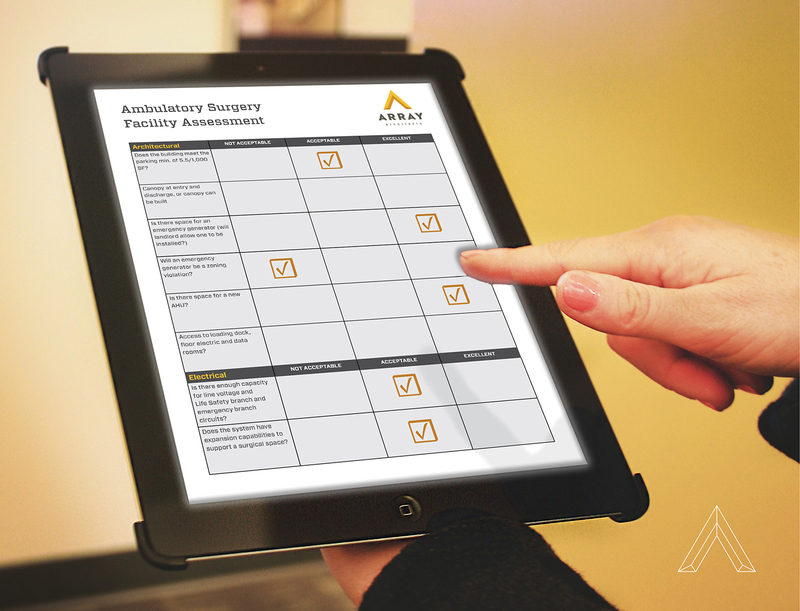 When assessing a facility’s qualifications for an ASC, a health system must first determine what type of ASC it is looking to build and then work with a healthcare architect and real estate broker to find appropriate buildings to assess. Prior to design and construction of the Laser Spine Institute’s Outpatient Surgery Center, Array Architects surveyed six potential building locations using a well-vetted and inclusive process that covers five building components: Architectural, HVAC, Electrical, Plumbing and Fire Protection. During the initial site visit, the architect and engineer evaluate each category to determine a facility’s general sustainability as an ASC. From general requirements, such as sprinkler systems, to specific requirements, such as column spacing, Array’s process is thorough. For instance, you plan to build a Class B operating room on the third floor of a building. The architect and engineer will go to the site specifically looking for square footage, floor-to-floor space, fire ratings and elevator specifications. Does the space you want to lease have a minimum of 250 SF clear with a 2-2-2 construction fire rating covering the building structure between the ASC and adjoining spaces? Does the unit meet the minimum required floor-to-floor space of 9.5 feet? Does the building have an elevator? If so, does it have a minimum clear space of five feet to accommodate a stretcher? Does the municipality require an elevator be on emergency power? The parking capacity, canopy, emergency generator, space for an air-handling unit (AHU) and a loading dock with an access path are also considerations that require analysis. Does the building have the required 5.5 cars of dedicated parking per 1,000 SF of ASC? Will the building owner allow a canopy if one does not exist? If the building has an emergency generator, does it have the capacity needed to meet the requirements of use for an ASC? If not, can one be installed and will the installation be a zoning violation? Every generator must be exercised, creating a noiselevel that might violate the noise restrictions of some communities. Does the roof have space for an AHU to serve the special air filtration requirements of ORs and recovery? If so, the architect must determine whether there is live load capacity on the roof. If there is no space on the roof, or if it is not needed on the roof, is there space outside of or within the building for the AHU; and will the property owner allow it to be placed there along with the air intakes and exhaust on the outside of the building? With surgery centers, there is a need for bottled gases that are not common in typical office spaces. Is there a loading dock with an access path to deliver the DEWARs? The building must have enough capacity to not only have the line voltage, but also Life Safety branch and emergency branch circuits. Are the floor-to-floor lights or ceiling clear measures appropriate? Do the floor separations have a minimum one-hour fire rating? Does the building even have enough capacity to house a surgical suite? After the visual survey, the design team prepares a report that summarizes the suitability of the building as well as their recommendation. The report should also provide recommendations that need to be addressed with the building owner. Most often at the time of the visual assessment, the architect does not know if a canopy can be added, if there is a space for a generator and whether the building owner will allow a generator. There is not a decision at that point whether there is a mechanical unit that can go up in the building because it may have to go through other tenant spaces if it is on the first floor and the building is more than one floor. Alternatively, if it can go outside, will the building owner allow penetrations and diffusers along the perimeter of the building? Once the evaluation is made and the follow up criteria are resolved between the building owner, real estate broker and tenant, the tenant can make an informed decision about whether this location is desirable for their use. A building should meet not only the zoning and healthcare codes, but also the tenant’s volume and specialty needs. Retaining a healthcare architect and engineer to perform visual inspections help health systems better protect their investment in an ASC.